In a speech in august, Mr. Gavin Slater, CEO of the Digital Transformation Agency (DTA) in Australia, outlined five priority areas for the agency. Recently, the DTA made its submission to an ongoing Senate inquiry on ‘Digital delivery of government services’. The Finance and Public Administration Committee is reviewing whether government agencies can deliver services that uphold privacy and security, are reliable and usable, and deliver value for money. The report from the Committee is due to be tabled on 4 December 2017. 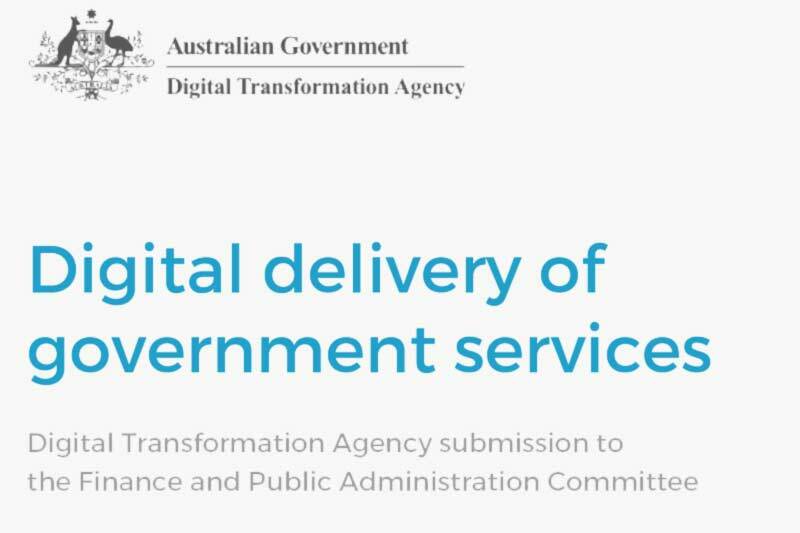 The DTA’s submission outlines the agency’s responsibilities to support the Australian Government’s digital transformation agenda, which focuses on delivering better and more accessible services to individuals and businesses. It provides detailed progress updates and plans in the 5 priority areas. We provide a summary below. The DTA recently started developing a digital transformation roadmap that will show how users interact with government across different portfolios. The roadmap will also identify opportunities to improve user experience of the most-used services that the government provides. It will be delivered iteratively over the course of 2017–18. The government will be able to use this roadmap to identify and fund the digital transformation initiatives that will have the greatest impact on user experiences. The roadmap will also provide a way to measure digital maturity to allow the government to track progress over time. The roadmap will track significant ‘life journeys’ that trigger engagement with government, and will provide a framework for assessing how digital initiatives will contribute to making these life journeys easier, faster and simpler for users. The DTA is collaborating with the Department of Human Services (DHS), the Department of Employment (DoE), the Department of Social Services (DSS), the Department of the Treasury (DoT), the Department of Industry (DoI), Innovation and Science (DIIS), the Department of Immigration and Border Protection (DIBP), and the Australian Taxation Office (ATO) to map two life journeys: ‘Finding Work’ and ‘Growing a Business’. The DTA is coordinating work on a number of whole-of-government digital platforms that will help agencies deliver services to their customers — like identity, change of address and payments to government. Tell Us Once – users will be able to choose to share details like updated addresses and phone numbers across government agencies, instead of updating each one separately. Notifications – agencies will be able to contact users through their preferred channel, such as email or SMS. Payments In – users will be able to access a simplified and consistent set of options for making payments to government. Federated Data Exchange – agencies will be able to to quickly and securely share information across government. This work is expected to start in October 2017. Discovery work for Tell Us Once, Notifications and the Federated Data Exchange is planned to be completed by mid-2018. In partnership with DHS, the DTA will continue to build on the myGov 2.0 release (A revamped version of MyGov with a new look and feel was launched in May this year). The DTA will provide user experience feedback about current Notifications and Tell us Once functions and investigate incremental improvements, such as better information about updating addresses across a number of services using myGov, making it easier to link to services using myGov and providing additional information to users about the source of notifications from government services. Discovery work for Payments In is expected to be done in late 2018. Once completed, the platforms will mean Australians will only need to update their details once when dealing with different parts of government, and will benefit from notifications services, allowing them to nominate their preferred channel for contact, such as email or text. The DTA has also been working on a secure cloud strategy since April 2017, to increase government understanding and adoption of cloud services. Work on the strategy is almost complete according to the submission and it is expected to be released later this year. It will give agencies a clearer understanding of how government can harness the opportunity of cloud to increase agility, reduce duplication, increase efficiency and improve competition to get value for money from ICT investment. It will provide the frameworks and platforms for agencies to ensure they have the confidence and capabilities to move services to the cloud. Within this priority area, the DTA is also working with agencies to increase the number of digital services reporting on the Performance Dashboard, the Beta version of which was released in February 2017. There are currently eight government services and products reporting on the performance dashboard. In September 2017, the DTA took over responsibility for the management of the data.gov.au and NationalMap platforms will move from the Department of the Prime Minister and Cabinet. The DTA has oversight of all significant ICT and digital investments by the government through the Digital Investment Management Office (DIMO). The DIMO was established in November 2016 to improve how agencies initiate, plan and deliver digital and ICT investments across government. It is made up of the Portfolio Management Office, the Digital Investment Office and the Cyber Security Unit. The Portfolio Management Office monitors all digital and ICT initiatives with a budget of more than $10 million and not classified as Secret or Top Secret. As of September 2017, the office is monitoring 72 projects with an aggregate budget of $7.2 billion and an ICT investment component of $5.3 billion. PMO engages on priority initiatives where agencies’ self-reporting identifies, or the where the DTA detects, material risk to successful delivery and/or intended benefits; where it is directed to review a project by the government; and/or where the DTA is specifically funded to provide oversight. The office has also produced the Digital Portfolio Investment Report to provide a comprehensive picture of ICT and digital technology investments. The Digital Investment Office provides advice to government on future ICT investments. The office engages early with agencies that are bringing forward new proposals to be considered by the government, to ensure they align with the government’s agenda and priorities. So far, the office has provided specialised briefing to the Digital Transformation Committee of the Cabinet for proposed investments worth more than $2 billion. The Cyber Security Unit was established on 1 July 2017 in response to the recommendations of the Review of the Events Surrounding the 2016 eCensus. The unit is a specialised security team that collaborates with agencies to improve the government’s security posture. It is estimated that coordinated procurement has reduced the government’s ICT costs by about AU$1.2 billion since 2008. It has also reduced duplication, improved transparency and increased agency compliance with policy. The DTA’s coordinated procurement is implemented through a range of mandatory ICT coordinated procurement arrangements including for data centre facilities, hardware equipment and services, mobiles phones, Microsoft software, and telecommunications services. The DTA is expanding the number of ICT coordinated procurement arrangements, with negotiations underway with major IT vendors SAP and IBM and negotiations expected to soon begin with Oracle. Together, these three vendors have 283 contracts in place (from 2005) with the Australian Government worth approximately $2.5 billion. The DTA is transforming how government manages its ICT procurement, in response to the Report of the ICT Procurement Taskforce, released in August 2017. The program of work aims to remove the systemic and cultural barriers to small business receiving government contracts, and aims to increase small-to-medium enterprises’ share of the government’s annual ICT contract spend by 10 per cent. There is also a target in place to reduce total annual ICT spend by 10 per cent over the next four years. The DTA also launched the Digital Marketplace in August 2016. The Marketplace has listed over 290 opportunities, approved more than 640 sellers, and registered over 760 government buyers. More than AU$40 million worth of contracts have been awarded through the marketplace and 81 per cent of these, worth AU$32.5 million, have been awarded to SMEs. The DTA owns the Digital Services standard, and supports its implementation across government by providing guidance, training, advice, and help with assessments. It has been mandatory since May 2016 for new or redeveloped public-facing services of non-corporate Commonwealth entities. As of 30 June 2017, the DTA has trained about 1,300 staff to use and apply the standard when developing services, and has taught more than 500 assessors to assess services against the standard. The DTA has also helped with, advised on or carried out 44 assessments of services under the standard. Last week a review of the standard was announced. The DTA is working with the Australian Public Service Commission to raise digital capability across the APS through the Building Digital Capability Programme. This programme, announced in the 2017–18 Budget, aims to attract and retain digital talent across government, help provide leading-edge digital training to agencies, and deliver a digital transformation leadership program. The leadership program is expected to commence delivery early in 2018. The DTA is also responsible for overseeing the Australian Government ICT Apprenticeship Program, the Australian Government ICT Cadetship Programme, and the Australian Government ICT Graduate Programme. Since 2007 these programmes have matched people interested in an ICT career with agencies looking for new ICT talent. These programmes received 1,387 applications for 173 positions available across 15 participating agencies in the 2018 cohort. Collaboration centres: The DTA has set up a collaboration centre in Sydney and has plans to set up another in Canberra. The centres will give agencies a place where they can build their digital capabilities, such as agile delivery and user-centred design, and access hands-on learning opportunities from private sector experts, as well as develop and iterate their digital services. Whole-of-government content strategy: The DTA is leading a whole-of-government content strategy to improve how information is made available on government websites. There are currently more than 1,500 government websites, and more than 44 million content items. Common user journeys can involve a dozen websites with potentially hundreds of pages of content. More than 30 government agencies are working with the DTA to develop the strategy, which aims to reduce the amount of content on government websites, improve its quality and guide agencies on how to be more efficient with developing content. Work began on the strategy in February 2017, and is expected to be completed by the end of 2018. Guides: The DTA is developing a set of guides that will be a single source of best practice information on service design and delivery. The guides will also support online communities of practice where users can engage across government, showcase successful application of the standard and other examples of best practice service design and delivery. The guides will feature content about user research, the service design and delivery process, starting a team and content strategy. Design system: The DTA is developing a whole-of-government design system in collaboration with a community from across the government. The design system works like a catalogue of reusable design components, including code, that can be used freely by agencies. The design system is already in use by eight agencies, and components from the catalogue have been used to support high-profile services such as myGov 2.0. The submission documents from the DTA, as well as other public and private organisations and individuals can be accessed here.